According to Popular Mechanics, there are 5.6 million tractor trailers on U.S. roads. Semi-truck refers to the front part of the truck, the part of the truck where the driver’s cabin is located. The trailer is the part of the truck where the transported goods are stored. The truck is comprised of two parts, the semi-truck, which is where the driver is located, and the semi-trailer, where the goods are stored. The average semi-truck will cover approximately 45,000 miles in a given year, but the estimates put forth by the Federal Highway Administration are also much higher. These trucks are heavy. The average trailer can weigh as much as 80,000 pounds. It is no wonder why accidents involving these trucks can be so devastating. With the sheer weights involved and the sheer number of miles these trucks travel, yearly accidents are inevitable across the industry, though many can be avoided. Truck accidents can be devastating for victims and their families. Victims may suffer serious and life-altering injuries, families may struggle to pay bills, and many may not know where to turn after a crash. If you or a loved one was hurt in a semi-truck accident, contact Madalon Law. Our semi-truck accident law firm works closely with victims and families to help them seek damages and protect their rights after a crash. We offer clients a free case review and we only get paid if you win. Contact us today to learn more. Jackknife Accidents. If a truck driver brakes hard and fast, or is traveling too fast, the truck can jackknife. In an accident like this, the semi-truck’s trailer turns and forms a 90 degree angle with the truck’s cabin. Jackknife accidents can occur because a driver was speeding and needed to suddenly brake, or when a truck’s anti-lock brake systems fail. Anti-lock brakes can fail because of poor maintenance, a failure of the truck company to maintain its vehicles, or due to errors of repair or manufacture. Jackknife accidents can be incredibly deadly to other drivers on the road, because they can be unexpected and can affect multiple lanes of highway traffic. Rollovers can occur if a truck driver accidentally goes off the road and then tries to correct by going back on the road. These accidents can be deadly, both for truck drivers and for others on the road. Truck drivers can drift off the road due to fatigue or due to a failure to abide by federal hours of service laws. 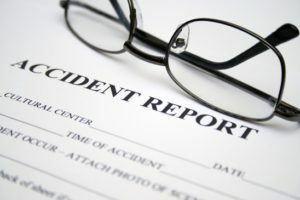 If you or a loved one was hurt in a truck rollover accident, the semi-truck lawyers at the Madalon Law Firm in Fort Lauderdale, Florida can review the truck driver’s logs and shipping schedules to see whether the driver was following hours of service laws. Tire Blowout. If a truck company or driver fails to check tires and change tires regularly, the truck can be at risk of a blowout. Sometimes truck companies try to cut corners by using used tires, which can lead to a blowout. Tire blowouts are often the result of an overloaded truck. Another cause of tire blowout occurs when tire pressure isn’t regularly checked. If the tire pressure is too low, the rubber can overheat, eventually leading to a blowout. The risk of tire blowout is that the driver can lose control of the vehicle. Drivers must be properly trained to manage blowouts, but because they are so rare, drivers may not always react properly. Interestingly, when a tire blowout occurs, drivers should not hit the brakes right away, but instead should accelerate a little to maintain proper momentum, regain control, and then slow down steadily before pulling over. If you were hurt in a semi-truck accident due to a tire blowout, the Madalon Law Firm are semi-truck accident attorneys in Fort Lauderdale, Florida who can review maintenance schedules to determine whether a blowout might have been the cause of your accident. Blind Spot Accidents. Trucks need to change lanes. 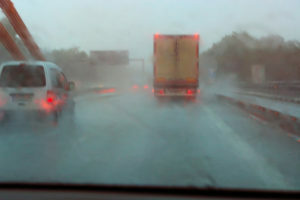 However, if the driver does not see another driver in its blind spot, tragic accidents can occur. Drivers can decrease their risk by only passing trucks on the right side, and by understanding where truck blind spots are located. Still, truck drivers have a responsibility to be trained in how to manage their blind spots safely. Lost Loads. Semi-trucks are at risk of lost loads. If trailers are not properly secured, a truck can lose its trailer on the road, which can lead to accidents with other vehicles. Under Ride Accidents. If a truck stops suddenly, and a passenger vehicle behind the truck cannot stop in time, the passenger vehicle can become pinned under the car. These under-ride accidents are often deadly because the top of the car becomes crushed. These are just some of the kinds of truck accidents that can occur. As you can see, in many cases, these accidents occur due to driver error, due to improper maintenance, or due to improperly loaded trucks. If you or a loved one was injured in a semi-truck accident, you may have important rights under the law. For example, you may be entitled to seek damages for your medical expenses, lost wages, and pain and suffering. Madalon Law is a semi-truck accident law firm in Fort Lauderdale, Florida who works with families and survivors of these accidents. Truck companies make billions every year. If you or a loved one was hurt in a semi-truck accident, the truck company, driver, or insurance company may be responsible for paying you for your damages and losses. Semi-truck accident claims can often be complex because of the laws and regulations that govern truck drivers. Madalon Law is a semi-truck accident law firm in Fort Lauderdale, Florida who understands the laws that truck companies must follow and can hold companies accountable when they cut corners or violate the law. If you’ve been hurt, contact a compassionate and caring truck accident lawyer in Fort Lauderdale, Florida today. Madalon Law offers free case reviews and only gets paid if you win.